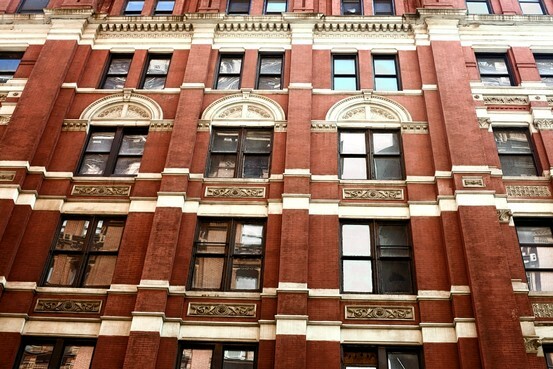 At the request of building representatives, the pictures of 5 Beekman Street have been removed from Scouting NY. I’m really sorry, and we hope to have permission to republish them in the near future. What an amazing treasure, thankfully landmarked in 1998. Hopefully, restoration/conversion plans will do it justice. 5 Beekman Street has a secret. You’ve probably passed it a million times in your travels through downtown Manhattan. Anyone who has ever visited J&R Row or hit the Starbucks on the opposite corner for a post-Brooklyn-Bridge-walk bathroom break has probably noticed its twin towers, and perhaps wondered how much its wealthy tenants must pay to live behind its beautiful brick and terra-cotta facade. The Temple Court Building and Annex consists of two connected structures on the designated Landmark Site. The nine-story (ten stories in certain portions) Temple Court Building was commissioned by Eugene Kelly, an Irish-American multi-millionaire merchant-banker, and built in 1881-83 to the design of architects Silliman & Farnsworth. Executed in red Philadelphia brick, tan Dorchester stone, and terra cotta above a two-story granite base, the handsome vertically-expressed design employs Queen Anne, neo-Grec, and Renaissance Revival motifs. Today, Temple Court is the earliest surviving, essentially unaltered, tall "fireproof" New York office building of the period prior to the full development of the skyscraper. Furthermore, it is an early example of the use of brick and terra cotta for the exterior cladding of tall office buildings in the 1870s and 80s, as well as a rare surviving office building of its era constructed around a full-height interior skylighted atrium. Its two towers foreshadow the pyramidal form that later became popular for skyscrapers. The Annex to the building, clad in Irish limestone on its principal Nassau Street facade, was constructed for Kelly in 1889-90 to the design of James Farnsworth, in an arcaded Romanesque Revival style that complements the original building. Temple Court's significance is enhanced by its visibility as it rises above the low buildings of Park Row facing City Hall Park, its prominent towers, and its articulated facades on three sides. Last edited by Merry; June 19th, 2010 at 05:07 AM. This is as good as it gets in terms of saved or preserved old NewYork. Gorgeous workmanship. I think I get to see something of what was lost in the old U.S. Army building at 39 Whitehall Street in terms of the skylight and atrium affect on the interior. This building is of course AAAA compared to that buiilding still standing but "Reclad" serving another function. Thanks for the look at the photos of a truly remarkable landmark NYC property. 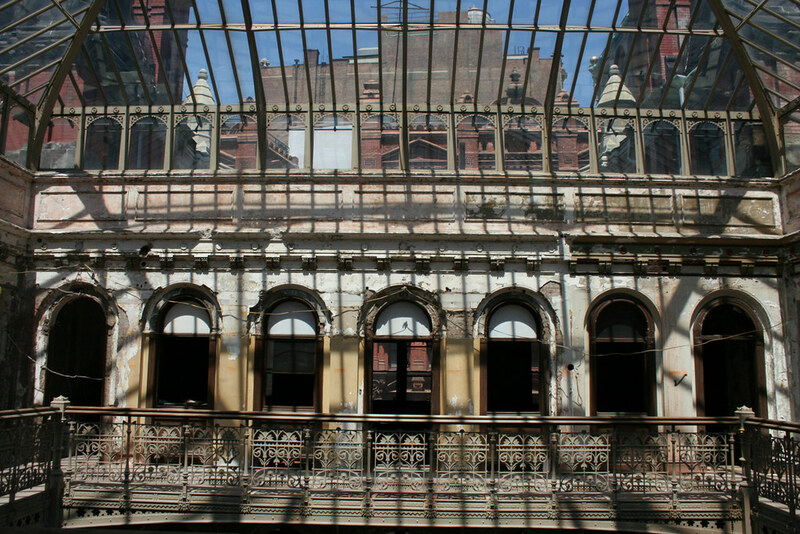 The elaborate skylight and decorative ironwork of the Temple Court building, a city landmark and once one of the best-known office buildings in New York, has long been hidden from view in a vacant, deteriorated property. 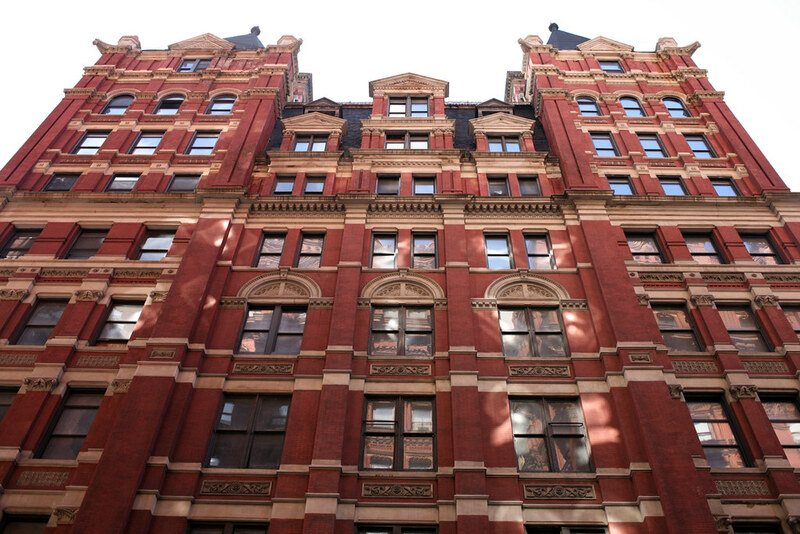 The ornate building at 5 Beekman St. is a city landmark. Talks to resolve a foreclosure action are under way. But now, despite a foreclosure proceeding, there are signs that some of Temple Court's long-forgotten glory may soon be restored. Ownership of the nine-story building at 5 Beekman St. near the foot of City Hall Park changed twice during the past decade. It ended up in the hands of the Chetrit Group and Bonjour Capital, which paid $61 million for the building in 2008. A foreclosure action was filed against those owners in September, according to court records. But the court file showed settlement talks were underway, and a person familiar with the matter said a deal may be signed within the next few days. That would set the stage for the Chetrit-Bonjour venture to move forward with reconstruction plans. A spokesman for the owners declined to comment. In the past, the venture has filed building plans to convert the 128,000-square-foot site into a hotel with more than 180 rooms. The Chetrit Group is a real-estate investment company owned by the family of Moroccan-born Joseph Chetrit and is one of the owners of the Willis Tower in Chicago, the country's tallest building, formerly known as Sears Tower. Bonjour Capital is headed by Charles Dayan, a creator of the Bonjour jeans brand. 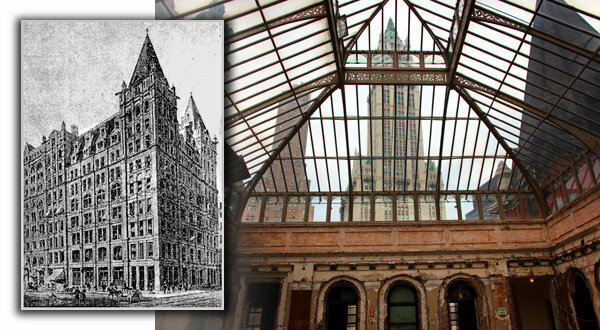 The Temple Court building was put up in two stages beginning in 1881, as part of a wave of construction of tall, fireproof buildings with elevators that went up in lower Manhattan at the dawn of the skyscraper. A landmark designation report by the city said it was the earliest surviving building from that period. It is built around a nine-story central atrium surrounded by Victorian iron railings on every floor. At the top is a pyramid-shaped skylight of glass and ironwork. 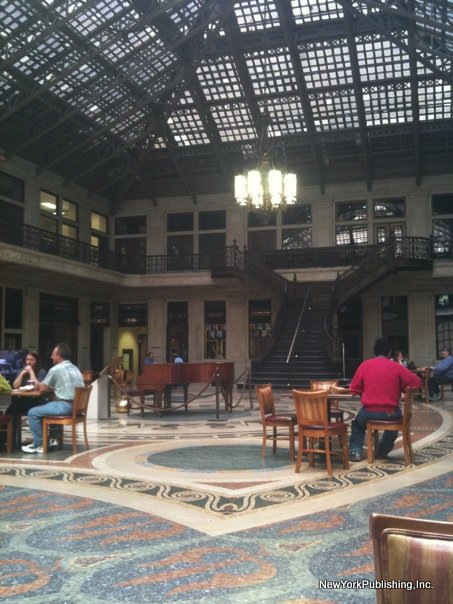 For decades, the central atrium was walled off from the public view. But, as the building was emptied out of commercial tenants, the space has been opened up again. In the past few months, the owners began to move forward with their plans again to show off the one-of-a-kind atrium. The space has been offered for photo shoots and films. Harper's Bazaar did a fashion shoot there for a forthcoming issue and scenes for a new TV show, "Rubicon," were shot there. A blog article posted by Nick Carr, a film location scout, titled "The Abandoned Palace on Beekman Street" was picked up by other blogs this week. The Chetrit-Bonjour group put up $22 million in cash for the building in 2008 and Pacific National Bank provided a $45.7 million mortgage. The foreclose action filed in September said that the developers had fallen behind in interest payments. But in a response, the developers said that Pacific National had promised to provide an additional $44 million in construction loans, but backed out of the deal during the credit crunch. In October, regulators closed the bank, turning its assets over to US Bancorp of Minneapolis. A riot of styles: gotta love the late 'long' 19th century. That atrium is amazing. I really hope they can fix this up. Wow. That atrium. I wish the public could have access after the renovation. What a sin to have that magnificent space go unused, unseen, and unappreciated. Reminds me of the Bradbury building here in L.A. Developer Jacob Chetrit filed a $50 million lawsuit against Bonjour Capital's Charles Dayan, alleging the investment partner reneged on a deal to pay off a defaulted construction loan after the lender filed to foreclose on their Beekman Street hotel project in Lower Manhattan. In a suit filed Aug. 12 in New York State Supreme Court, Chetrit alleged that Dayan agreed to pay his share of a reduced settlement in the foreclosure case at 5 Beekman Street, where the two investors planned to convert a landmark office building into a 200-room luxury hotel. The investors bought the 10-story office tower at Nassau Street, originally built in 1883, from Ruby Schron of Cammeby's International for $61 million in April 2008. The lender, San Francisco-based Pacific National Bank, filed suit in August 2009, alleging that Chetrit and Dayan defaulted on a $45.75 million loan. Under a settlement deal signed last month, U.S. Bank, which later acquired the assets from Pacific National, agreed to accept a $21 million payoff if made within 90 days, or $22 million if made within 180 days, forgiving the remaining balance. Chetrit, in his lawsuit, claims that he and Dayan each agreed to pay $4.25 million by October 2010. Chetrit claims he fronted Dayan's share of the money to U.S. Bank. "These guys were negotiating for like six months or a year [with the lender]," Chetrit's attorney Stephen Meister told The Real Deal. "Then Dayan said, 'I'm not paying it.'" Meister says that Chetrit could be held responsible for the entire balance if Dayan fails to pay his share of the loan. Dayan did not return repeated calls for comment. Jay Lefkowitz, who represents Dayan in the Chetrit suit, was not immediately available for comment. Stephen Ellman, the attorney representing the lender, wasn't immediately available for comment. Meister also filed a motion Aug. 12 to appoint a temporary receiver for the property. Lefkowitz, in a letter sent yesterday to Judge Shirley Kornreich, requested additional time to answer the motion by Aug. 25. The photos are back . Gorgeous. A huge skylight was a long-masked feature of Temple Court, which predates the Woolworth Building, seen through the skylight. At left, an early rendering of Temple Court published in The New York Times in 1945. So it was that Stacey Corr, a bankruptcy lawyer, and Richard Irvine Jr., who works in finance, came to find themselves one day in July in front of 5 Beekman Street — a mysterious, stately, even lovely nine-story building overlooked by modernity. The doors had been mostly locked tight for years and covered with brown paper and permits for scaffolding, the floors inside dark and empty. The place was called Temple Court. The couple approached and saw a slender man about their age standing outside. Mr. Irvine, 28, struck up a conversation, the way he does all the time. The stranger was Hillel Spinner, a broker and hotelier who worked with one of the owners of the building. The existence of so much empty space near the tip of Lower Manhattan was startling. The last tenant, an architect, had left almost a decade before, his lease expiring, as had those of others before, without an offer of renewal. The owners, alone with their vacant building at last, removed unnecessary drywall and discovered the old majesty of the place. Pictures of the interior, impossibly lush and filigreed, surfaced online and quickly became the talk of blog town, in the way that these discoveries do. New Yorkers love something hiding in plain sight. Ms. Corr was waiting patiently for her boyfriend of six years to shut up when, to her shock, Mr. Spinner invited them inside. The little lift with no windows was slow going. It rumbled to a stop six floors up, and the doors opened to reveal a spectacular sight: Daylight shone down from a roof of glass, lighting floor upon floor of halls stacked around a central atrium. A few steps out of the elevator, one stood at an old iron railing, looking down all those floors and up at the sky. The elevator was like a time machine to prewar New York, and the yawning emptiness invited sepia projections from a modern imagination. How the typewriters must have sounded, the clop of polished shoes, a secretary’s splash of color amid the dark suits. And there was something else Ms. Corr saw: rose petals on the ground, leading around a corner and upstairs. Mr. Irvine said it must have been from some kind of photo shoot, but Ms. Corr was not buying it. “I was like, ‘Oh, you’re proposing,’ ” she said. Temple Court is like a groom in its own way: nervous, possessing of a very big promise. Its owners — two real estate developers, Bonjour Capital and the Chetrit Group — have been in a dispute over how to pay off a construction loan, but it appears near settlement. They expect to sell it soon to people who have plans to transform it into a high-end hotel with 200-plus rooms. To tour the fantastic, peeling shell of Temple Court and imagine the work and expense of turning it into a hotel makes one’s brain hurt. In the meantime, it is enjoying a second (third? fourth?) act as a sought-after backdrop for still and motion photography — the supermodel Iman and actors from the conspiracy thriller “Rubicon” have each faced cameras there. Thus, what once was downtown’s premier office building has become, in the name of show business, an Eastern Hemisphere prison and a forest for fairies. Between the scrape of dollies across the floor and the hum of the old elevator, stories from its real-life past — back as far as when it was little more than sketches on paper and known only as the Kelly Building — whisper in the dust. The builders promised that the 165,000-square-foot behemoth was fireproof. The test came quickly. NO one was sure how the blaze started — but the best guess of its origin was the office of Miss Margaret S. Powers, a typist in Room 725 of the Nassau Street annex. It was April 2, 1893. All was well when the night watchman left at 6:30 a.m., but an hour later, the janitor, Frank Leslie, who lived on the 10th floor, found the room he shared with his wife filled with smoke so thick they could not descend. They sought refuge on the roof. Firefighters hurried. Except for the poor Leslies, no one had been inside. The building held, but interior pine walls became fuel. Reports of the damage, read today, offer a time capsule to another era: a stack of $500 stocks in the Asbury Park and Loch Arbour Pier Company; thousands of envelopes bearing 2-cent stamps; a library of law books, ruined by water. In many news stories that followed, the words “fire proof” were ensconced in what later generations would call “ironic quote marks.” But the building is still standing, which is more than can be said for many of its contemporaries. Last summer, Mr. Spinner, the broker, invited Nick Carr, a film scout, to photograph the interior. The results, posted on Mr. Carr’s Web site ScoutingNY.com, were a sensation — so much so that Mr. Spinner asked that they be taken off the site to lessen the deluge of calls to his cellphone. Since the blog post, which Mr. Carr removed, the building is a highly sought canvas, reimagined as blown-out war zone, overseas prison, noir checkpoint, enchanted forest. For the AMC series “Rubicon,” Temple Court became a mysterious, foreign, black-ops torture chamber. “It looks kind of bombed out,” Tim Grimes, a set designer for the show, remembered thinking. “It didn’t look like you were in America. No America that I know, anyway.” Characters in the episode wondered aloud where they were, and one estimated the airplane that carried them there traveled 13 ½ hours. In reality, the building is perhaps a 13 ½-minute stroll from the financial district offices depicted in the show. Countless stories inside the walls of Temple Court had happy endings. The Leslies, huddled for what must have seemed like forever on the roof of a burning building, were rescued. The Iman photographer and the ostrich owner compromised and took pictures on the first floor. And the girl standing above the guy with his knee on the roses said yes. There was sparkling wine on a roof, the newly engaged gaping up at the nearby Woolworth Building. Then they left, and, for the time being, the building was empty again. 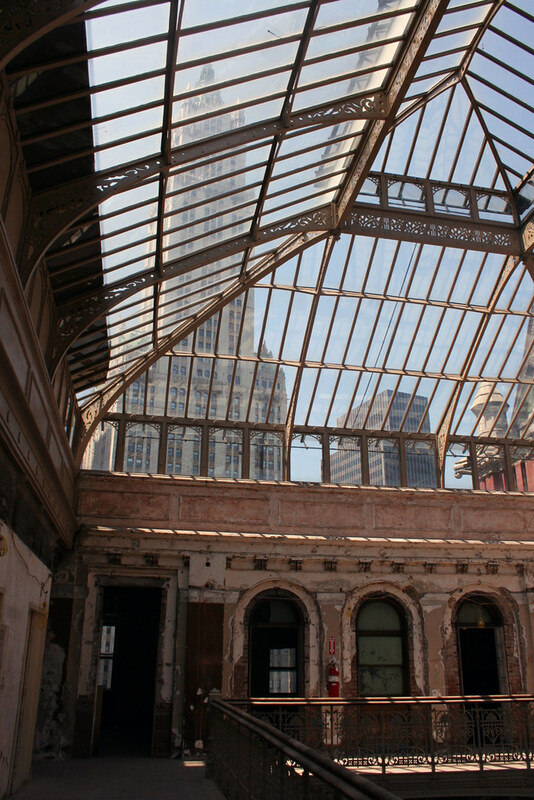 The decayed urban treasure at 5 Beekman Street came back into the spotlight last year, thanks to Scouting NY. The brick and terra cotta structure, also known as Temple Court, has stood empty for a decade, only recently allowing models in for video and photo shoots as Bonjour Capital and the Chetrit Group have battled out the building's ownership in court. 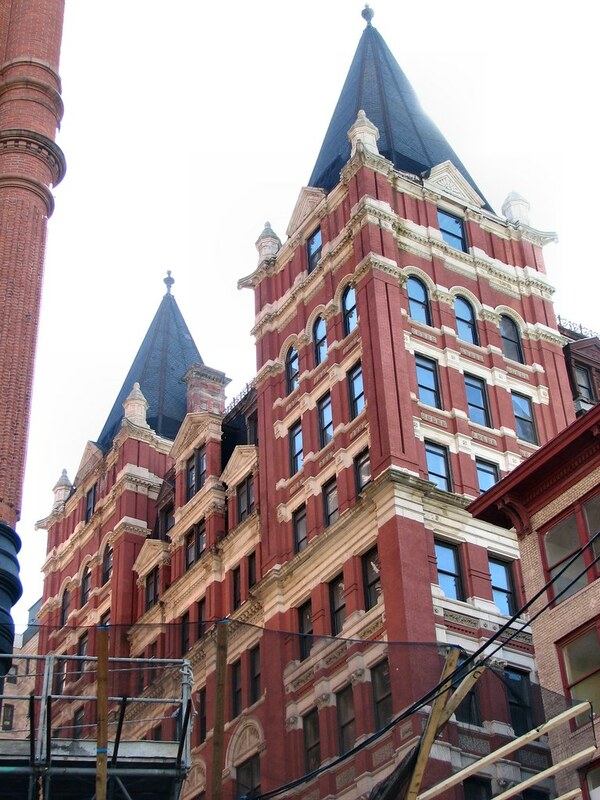 Consider all that 5 Beekman's warm-up: the property is officially in contract to hotelier Andre Balazs. The Daily News floated the rumor a few weeks ago, and now we have confirmation from Balazs' reps that he's planning to purchase the building (interior shots above, just because). Another source tells us Balazs—who is also taking over the Cooper Square Hotel—is still hunting for financing to complete the deal. That's a gorgeous building - inside and out. Hopefully this guy doesn't over lever it, and drive the refurb into financial purgatory.